There comes a point in everyone’s life where metabolism slows, muscles start to deteriorate, and the senses no longer feel quite as sharp. The effects of aging are inevitable. Every living person is always getting older, but it’s during the senior years that the effects of aging can really limit you. That’s why exercise only becomes more important as you get older. 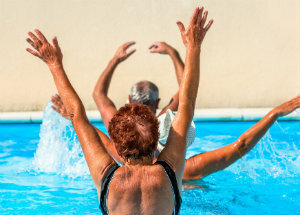 Staying active as you get older improves your health and helps you stay mobile. The older you get, the more your body slows down and gains unhealthy fat. Your heart weakens and your blood pressure and cholesterol increase. Muscles and bones thin out. Your brain and neurological functions start to deteriorate as well. You become far more susceptible to serious diseases like diabetes and peripheral arterial disease (PAD). Although exercise can’t entirely prevent these things from happening, it does slow the process down dramatically. Experts have known that exercise improves health for a very long time. Not only does it manage weight, improve bone density, and build muscle mass, it boosts circulation. It lowers your resting heart rate and decreases your risk for heart disease and diabetes. It increases your lung capacity. It improves reflexes, memory retention, sleep quality, and other neural functions. It even has a positive impact on mental health conditions like depression. These positive effects aren’t just for young people, either; they’re still there for seniors, dramatically improving their quality of life. All of these effects are especially helpful for your mobility. Stronger feet are able to support you and continue moving without pain. They help fight balance problems and are less likely to develop painful injuries. Exercise also helps you deal with foot complications from PAD and even diabetes. Staying active as you get older does mean you need to be careful, particularly if you’ve been largely sedentary. You’ll need to start slowly and adjust for any health problems you already have. As you slowly improve over time, you’ll be able to do more while staying safe. Walking – Walking is the easiest and most basic form of exercise. It’s easy to do even if you’ve been sedentary, and it’s not too hard on your lower limbs. Swimming – This exercise is great for your circulation and breathing, without straining your joints. Yoga – This activity builds muscles and improves flexibility without hard impacts, making it great for seniors with arthritis. Biking – This exercise builds muscle and healthy circulation without too much stress on your feet, either. Weight Lifting – A classic activity, weight lifting can build muscle and help your overall strength. It can be hard to establish exercise habits and live a healthy lifestyle as you get older, especially if you have been pretty sedentary for a while. This doesn’t mean it’s impossible, though. You can make new habits, take control of your health, and improve your life a little at a time. Our experts at Absolute Foot Care Specialists are happy to help you figure out ways to be more active safely. Don’t give up on aging and exercise—make an appointment at one of our Las Vegas locations. Call (702) 839-2010 or use the website contact forms to reach us.